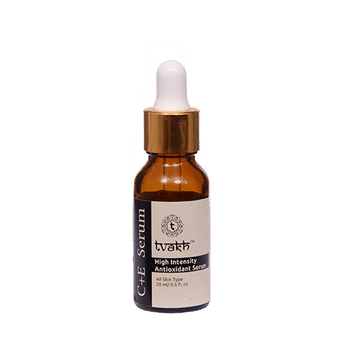 Tvakh's C+ E Antioxidant serum is a skin brightening ritual fortified with a blend of 3 different multifunctional skin lightening and firming active ingredients; Vitamin C, Plant Derived Vitamin E and Ferulic Acid. This powerful formula stimulates collagen and visibly minimize the fine lines, wrinkles and reduces the appearance of age spots and discoloration. A weightless, fast-absorbing, oil-free formula that penetrates deep within the skin, delivering antioxidant protection and optimum hydration.